Our doctors have an unmatched 200° view of your retina in a single panoramic image with the Virtual Point™ technology of the Optos Daytona. These ultra-wide retinal images give your eye doctors an important view of the inside of your eye so that we can better understand the current health of your eyes. We can also monitor changes that may happen over time as your eye health and body's overall changes. The new Daytona design is more compact, ergonomically designed for better comfort, and gives better imaging. All to help you. 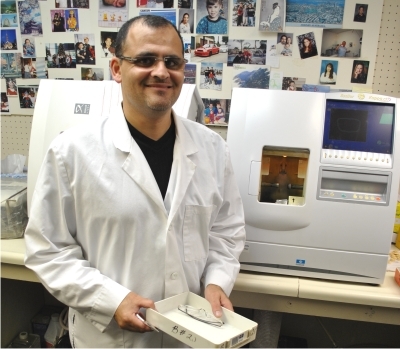 Our OCT is a state-of-the-art tool for glaucoma and retinal health assessment. The Zeiss 500 OCT does powerful tests to help our doctors identify early signs of eye disease that can lead to irreversible blindness. Diseases such as glaucoma, macular degeneration and diabetic retinopathy tend to progress without any pain in the early stages. Age is a major risk factor for development of many eye conditions. Did you know that retinal images are a great tool in the early detection of multiple retinal and systemic diseases? 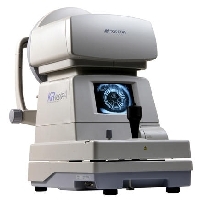 We now offer retinal photography with our new highly specialized digital retinal camera. A retinal exam can detect diabetes, hypertension, age-related macular degeneration, glaucoma, and other diseases. Many of these conditions will progress through several stages before they can affect your eyesight. With retinal photography and imaging, we are able to screen for early signs of retinopathy. When diagnosed early, various advanced treatments will be available to help us manage these ocular and systemic conditions. 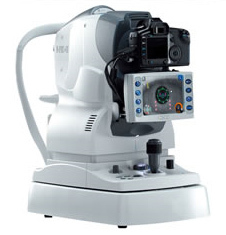 At Stein Optometric Center, we use Nidek AFC-230 retinal cameras, each with more than 21 megapixel resolution! See more on retinal photography. At Stein Optometric Center, we use a newer and much more advanced technique in evaluating our patients' visual fields or peripheral vision. 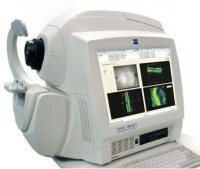 Using the Frequency Doubling Technology (FDT), we are able to detect certain visual field losses that are very specific to certain eye conditions. 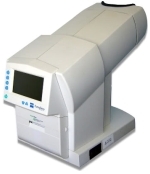 The examination can be completed at nearly half the time of a standard visual field analyzer. Studies have shown that this particular method of visual field assessment is highly effective in detecting early glaucoma damage and various ocular and neurological disorders. We at Stein Optometric Center believe that eye exams should involve quick and accurate measurements done with the least amount of discomfort. The Non-Contact Tonometry (NCT) is our preferred method of assessing a patient's intraocular pressure (eye pressure). This is an excellent and valuable method of screening for high eye pressures which may be associated with glaucoma. In most cases, our patient's eye pressure can be obtained with a very light "air puff." In certain circumstances, other methods of assessing one's eye pressure (via Goldmann tonometry) can also be performed at the doctor and patient's discretion. Whenever a patient expresses a strong interest in LASIK, corneal pachymetry is a vital test that must be performed. Pachymetry is a specialized procedure that is usually done with a light ultrasound. It allows us to assess a patient's corneal thickness which helps us determine whether someone is a good candidate for LASIK. In other instances, pachymetry is also performed whenever our doctors are suspicious of glaucoma from certain eye pressure readings. In addition to providing eye exams with the highest standard of care, we also specialize in fitting contact lenses to unique and difficult corneal cases. With a corneal topographer we create a detailed mapping of the front surface of the eye - the cornea. This enables us to design a better lens fit for patients with irregular corneas (including keratoconus or trauma-related) or eyes that have gone through various corneal surgical procedures (corneal transplants and earlier refractive surgeries). Have you ever experience a time when your glasses are either misplaced or accidentally stepped on and are now you are in desperate need of a replacement? Here at Stein Optometric Center, we have a state-of-the-art optical laboratory in our Manhattan Beach office that offers 1-hour service on most single vision lenses. Harry (pictured above) and Gabriel are two of our finest lab technicians who prepare optical lenses in-house at our Manhattan Beach office.